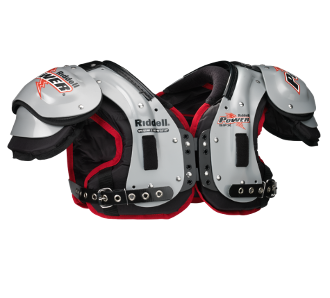 Designed to allow maximum movement of the shoulders, the Riddell Power SPX Adult Football Shoulder Pad – QB/WR are designed to keep you quick and agile. Recommended for quarterbacks and wide receivers, its sleek design, short swim cut arches with reinforced back and swivel fronts allow these pads to move with your body and lessen any restriction. Riddells air management system allows the pads to breathe and keep you from overheating on the field. The 1” BIOTHANE belt and STAC shoulder system give you added protection helping you gain the confidence to make the big play!